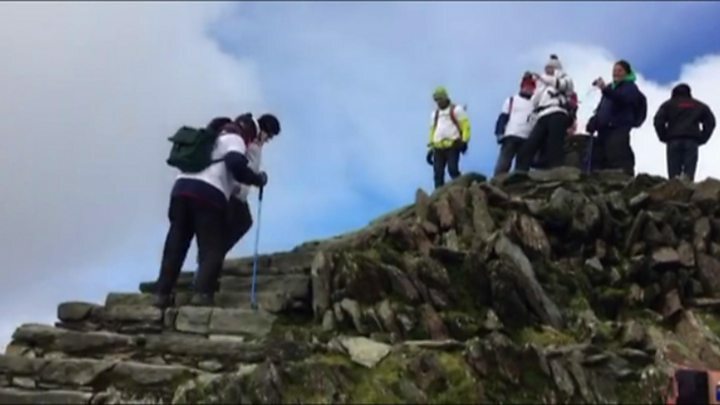 A man who underwent five coronary artery bypasses following a heart attack has climbed Snowdon. Jim Walker, of Rhosneigr, Anglesey, set out to claim a new Guinness world record to raise funds for cardiac rehabilitation. The mountain has never been climbed by a person with five bypasses before. Mr Walker said the climb was his way of saying thank you to those who helped him after his heart attack last year. "Without the support from the amazing team of staff I've met along my rehabilitation journey I wouldn't be walking up Snowdon, in fact I wouldn't be walking anywhere," he said. He added he wanted to do the climb to show people "it's not the end of the world if you have a medical problem and you can recover and recover well too".